Barrett Christie is an accomplished athlete who has won more medals in the Winter X Games than any other female competitor. She competed in the 1998 Winter Olympics as part of the first US women’s snowboarding team. She oversees the design of women’s snowboards for Gnu Snowboards, including the Gnu Barrett Christy Pro Model, the most enduring women’s pro model snowboard on the market. When Barrett needed an eye-catching graphic that still looked like a serious snowboard, she approached Pendleton. 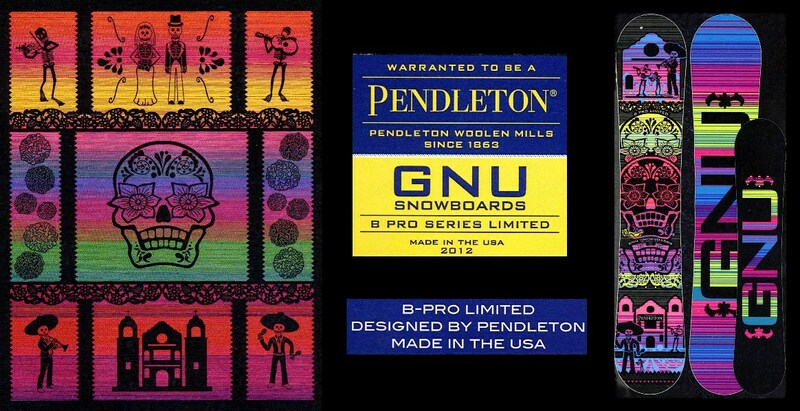 The result is our newest co-branding effort; a limited edition snowboard from GNU, featuring a graphic based on our Day of the Dead blanket. Every board comes with a specially labeled Day of the Dead blanket. Life in the Pacific Northwest is very, very busy for Barrett. She’s a serious competitor and product developer, as well as a mom. But she recently found a little time to talk to us about the new design. Karen: I’m sure you’re always looking for inspiration. What initially drew you to Pendleton? Barrett: My husband I have a collection of Pendleton blankets we’ve won as prizes at the Mt. Baker Slalom. We’ve won a lot of races, so we’ve won a lot of blankets. Karen: Was Day of the Dead one of the prizes? Barrett: No, they’re mostly Chief Joseph designs. That’s what I had in mind when I approached your Home division. Bob Christnacht and Jessica Camblin were educating me a little bit more about Pendleton, and I saw the Day of the Dead blanket, and it clicked. Karen: It’s a great use of the graphics. How has it been received? Barrett: Everyone loves it. It caused a stir at the shows, and I showed it at the latest X Games. Karen: How did it ride? Barrett: Well, the girls were not riding, but they wanted to try it! Karen: When and where will it be available? Barrett: It will be ready for our next winter season, which is 2012/2013. Karen: Any plans for Mervin/GNU and Pendleton in the future? Barrett: That’s a possibility! You know, the two companies may look a lot different, but we share the same philosophies. Our boards and your blankets are manufactured in the USA with sound environmental policies. That’s really important to us; it’s such a good match. We agree completely. Thanks, Barrett! If you’d like to know more about Barrett’s outlook and accomplishments as one of the leading women boarders in the country, go here. But first, here’s Barrett, the board and the blanket in a candid slideshow shot in our Home Division’s showroom.